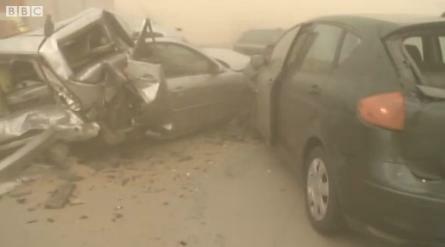 A district in Northern Germany saw a freak sandstorm which created an 80 car pile-up and caused at least 8 fatalities. Three lorries were involved and 20 cars caught on fire. Sand and dirt was blown on to the four-lane A19 near Rostock, close to the Baltic Sea in Mecklenburg-Western Pomerania state, on Friday. Strong winds, dry weather, and freshly ploughed fields were thought to have caused the incident. One motorist, named only as Steffen, told reporters that "all of a sudden, there was a black wall of sand and then I couldn't see anything any more and I was pushed into another car." He added "I have never seen anything like it before and it's difficult to describe. I think I will only later realise what happened. I think this is my second birthday today."